Wait. What? What do you mean we're not supposed to be in your Muffin Tin Monday drawer? Please note the "child-proofing" lock installed on the drawer. Mmmmmhmmmmm. Mess? I don't see any mess. Cort, quit looking at your hand! 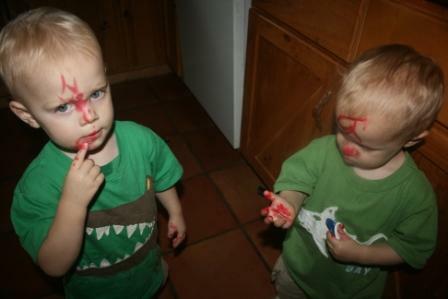 FYI: it turns out that Betty Crocker Food Writers markers stain the skin. Expect the staining to be completely removed after about a week. Soap and water, olive oil, baby wipes, and other methods of cleaning are powerless against Betty Crocker Food Writers. Only time will fade the marks. Until then, you will have Little Warriors. Happy birthday to my sweet twins. Today they are two! They still look cute! I hope they have a wonderful birthday. happy birthday, happy birthday boys!! I love it!!! It's amazing what they can get into...and how quickly. I know you've heard the term "double trouble"! "Two minds are better than one". What one little guy doesn't figure out, the other will. Happy Birthday to the adorable twosome! Oh dear! I'm glad it will wash off eventually! Your boys are a couple of total sweetie pies, and I hope they have a wonderful birthday today!! These pictures are absolutely priceless. Too cute for words. HAPPY 2nd Birthday to your adorable twins! Awe happy birthday to those cute and colorful little boys! Blah! So funny. Next up is the moment they discover how to cute their own hair. haha! That's hilarious. 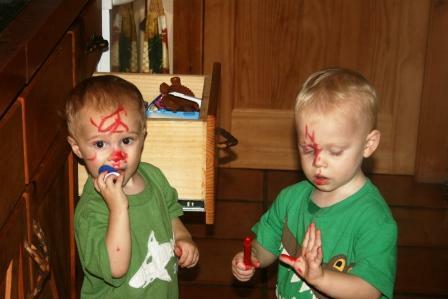 Did they decorate each others faces or their own? Grady gets into our drawers all the time, I have a post coming up about it. But we don't have childproofing on the drawers yet...we will soon hopefully. Oh, that is so funny! What a great look for the birthday pictures! Hopefully, the birthday theme will be about warriors, heehee! Happy 2nd Birthday to the twins! Wishing you all a wonderful day! LOL as long as nobody thinks they got injured ;-) Boys will be boys! I think childproof means only children can open it! 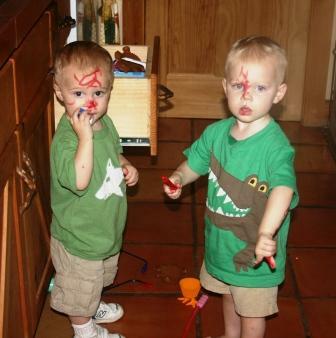 Your little warriors are 2, Happy Birthday! How fun! One looks like a little Harry Potter with the lightening mark on his head. Happy Birthday boys! Oh dear! Cute and messy ..... a great combo! Very cute, if 2 adults would do that to each other that would be called assault,lol. Richard from Amish Stories. Oh my word - that is too funny! Boys just have a way of getting into any and everything! My son took off the door knob from his door when he was 4. He's 7 now and begging for it to be put back on! lol I actually got it out for him today so it can be put back on. Oh my goodness that is AWESOME! Aziza did this with a sharpie one time... it was powerless to anything too. So funny looking back, definitely NOT funny in the moment though. Hope you and the family had a great day! Happy Birthday, twins!! LOVE those pictures of your little "warriors"! Oh my goodness they are so adorable! Even with all of the red on their faces they still look so darn cute!! Hope that they had a wonderfully blessed birthday! Hahahahahahhah!!! Oh I lOVE t! Hope they had a Happy Day!!!!! They were just decorating for their birthday celebration..Ha ha..Happy Birthday boys!! 2 year old warriors - that sounds about par for the course. Don't blink, because the next thing you know they'll be 18.